How can I compute on the attributes of a spatial object? Query attributes of a spatial object. Subset spatial objects using specific attribute values. Plot a shapefile, colored by unique attribute values. This episode continues our discussion of shapefile attributes and covers how to work with shapefile attributes in R. It covers how to identify and query shapefile attributes, as well as how to subset shapefiles by specific attribute values. 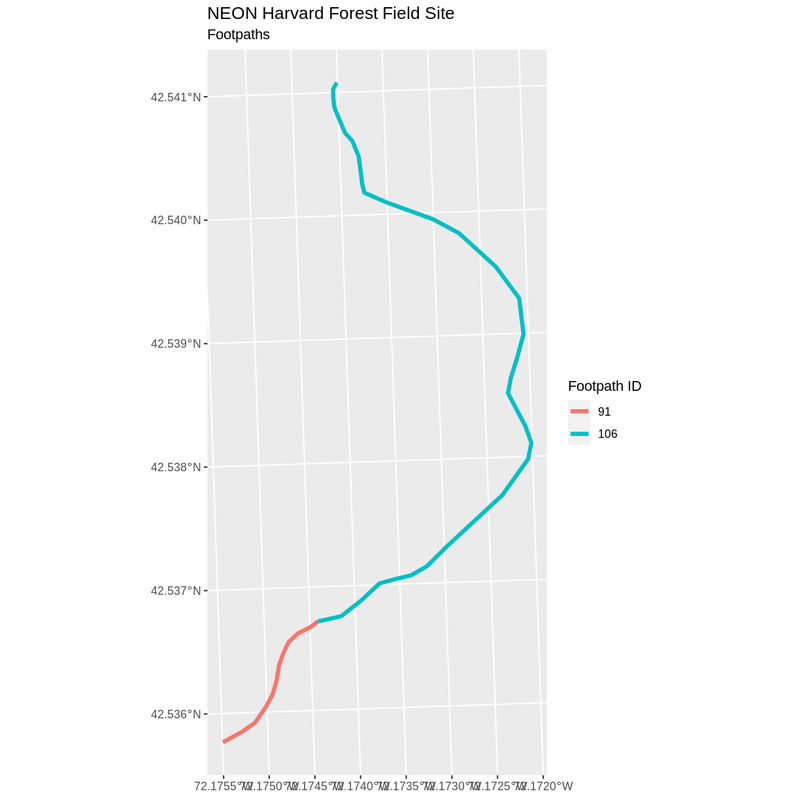 Finally, we will learn how to plot a shapefile according to a set of attribute values. 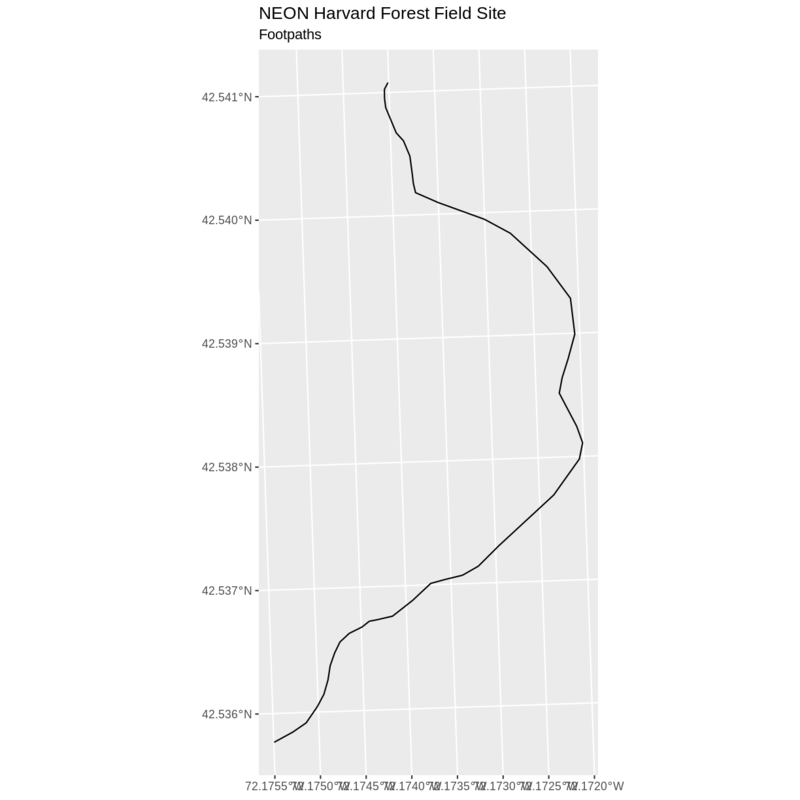 We will continue using the sf, raster and ggplot2 packages in this episode. Make sure that you have these packages loaded. 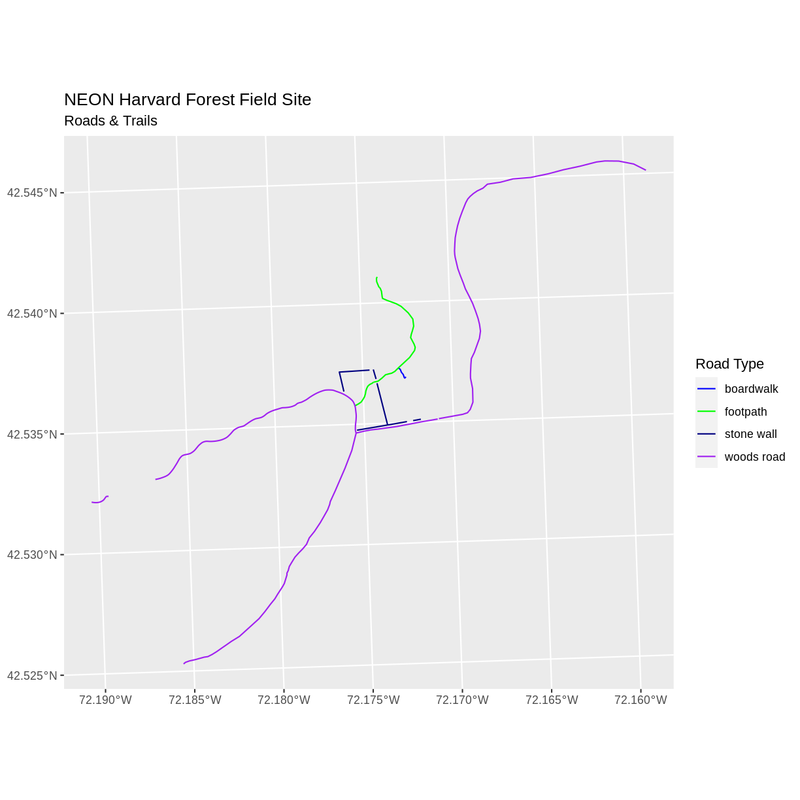 We will continue to work with the three shapefiles that we loaded in the Open and Plot Shapefiles in R episode. st_geometry_type() - The type of vector data stored in the object. st_bbox() - The spatial extent (geographic area covered by) of the object. st_crs() - The CRS (spatial projection) of the data. We started to explore our point_HARV object in the previous episode. To see a summary of all of the metadata associated with our point_HARV object, we can view the object with View(point_HARV) or print a summary of the object itself to the console. We can use the ncol function to count the number of attributes associated with a spatial object too. Note that the geometry is just another column and counts towards the total. "OBJECTID_1" "OBJECTID"   "TYPE"       "NOTES"      "MISCNOTES"
 "RULEID"     "MAPLABEL"   "SHAPE_LENG" "LABEL"      "BIKEHORSE"
 "RESVEHICLE" "RECMAP"     "Shape_Le_1" "ResVehic_1" "BicyclesHo"
Explore the attributes associated with the point_HARV and aoi_boundary_HARV spatial objects. How many attributes does each have? Who owns the site in the point_HARV data object? Which of the following is NOT an attribute of the point_HARV data object? "Un_ID"      "Domain"     "DomainName" "SiteName"   "Type"
 "Sub_Type"   "Lat"        "Long"       "Zone"       "Easting"
 "Northing"   "Ownership"  "County"     "annotation" "geometry"
“Country” is not an attribute of this object. We can explore individual values stored within a particular attribute. Comparing attributes to a spreadsheet or a data frame, this is similar to exploring values in a column. We did this with the gapminder dataframe in an earlier lesson. For spatial objects, we can use the same syntax: objectName$attributeName. To see only unique values within the TYPE field, we can use the levels() function for extracting the possible values of a categorical variable. The special term for categorical variables within R is factor. We worked with factors a little bit in an earlier lesson. 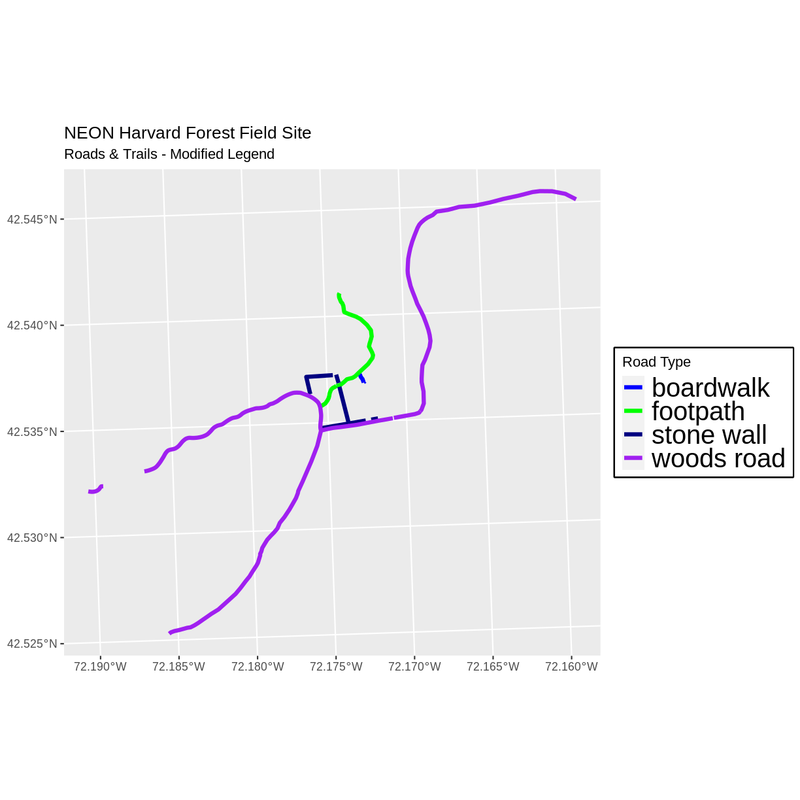 "boardwalk"  "footpath"   "stone wall" "woods road"
We can use the filter() function from dplyr that we worked with in an earlier lesson to select a subset of features from a spatial object in R, just like with data frames. For example, we might be interested only in features that are of TYPE “footpath”. Once we subset out this data, we can use it as input to other code so that that code only operates on the footpath lines. There are two features in our footpaths subset. Why does the plot look like there is only one feature? Let’s adjust the colors used in our plot. If we have 2 features in our vector object, we can plot each using a unique color by assigning a column name to the color aesthetic (color =). We use the syntax aes(color = ) to do this. We can also alter the default line thickness by using the size = parameter, as the default value of 0.5 can be hard to see. Note that size is placed outside of the aes() function, as we are not connecting line thickness to a data variable. Now, we see that there are in fact two features in our plot! 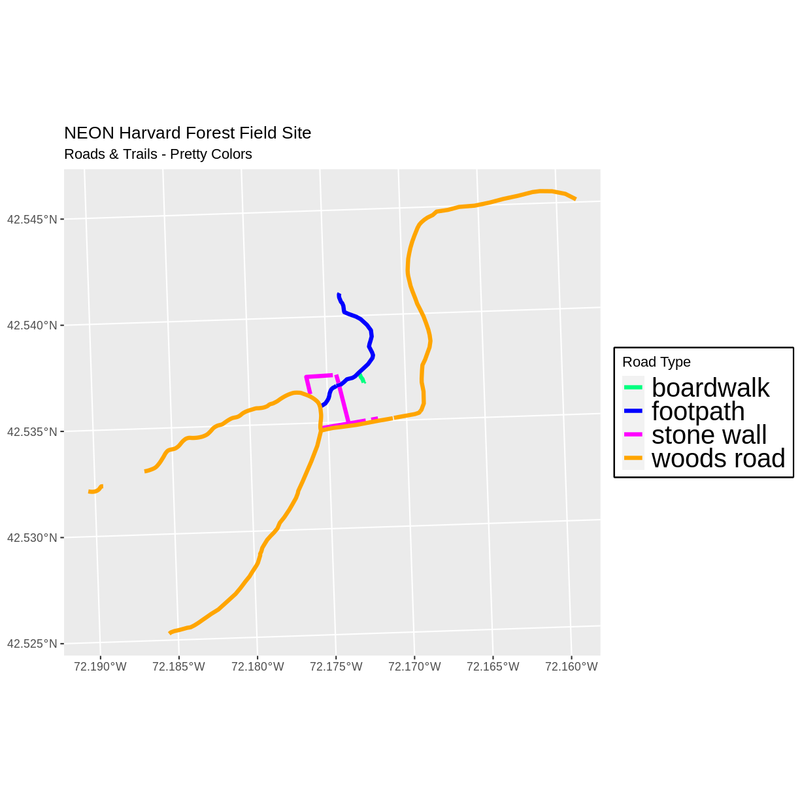 Subset out all boardwalk from the lines layer and plot it. Subset out all stone wall features from the lines layer and plot it. For each plot, color each feature using a unique color. the attribute itself ([object$factor]) of class factor. Then we can create a pallet of four colors, one for each feature in our vector object. We can tell ggplot to use these colors when we plot the data. We adjusted line width universally earlier. If we want a unique line width for each factor level or attribute category in our spatial object, we can use the same syntax that we used for colors, above. We already know that we have four different TYPE levels in the lines_HARV object, so we will set four different line widths. 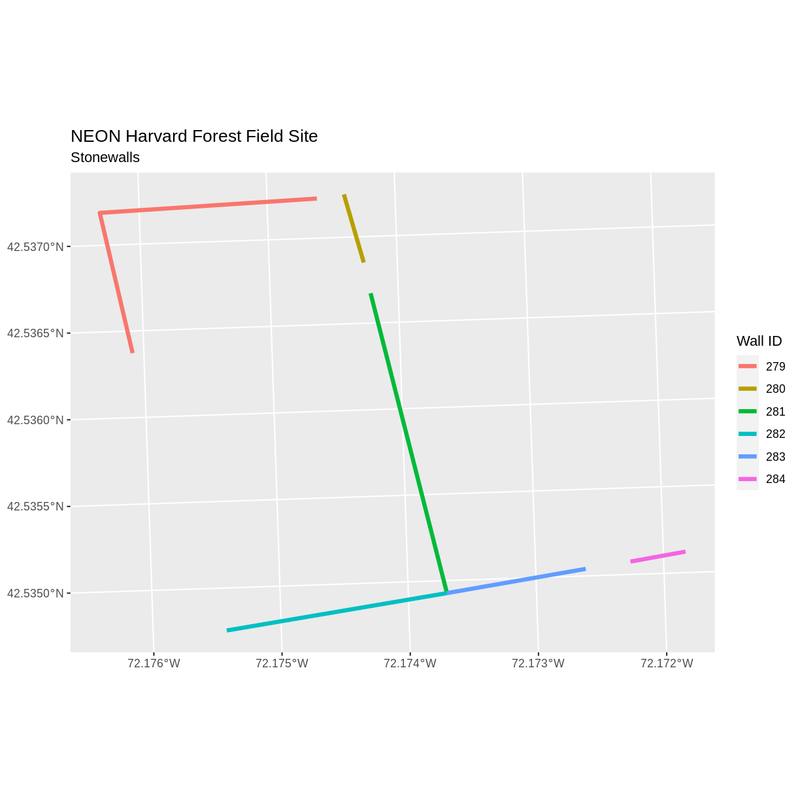 We can use those line widths when we plot the data. Note that we could also use aes(size = TYPE) to tie the line thickness to the TYPE variable, so long as we had been careful to set factor levels appropriately. 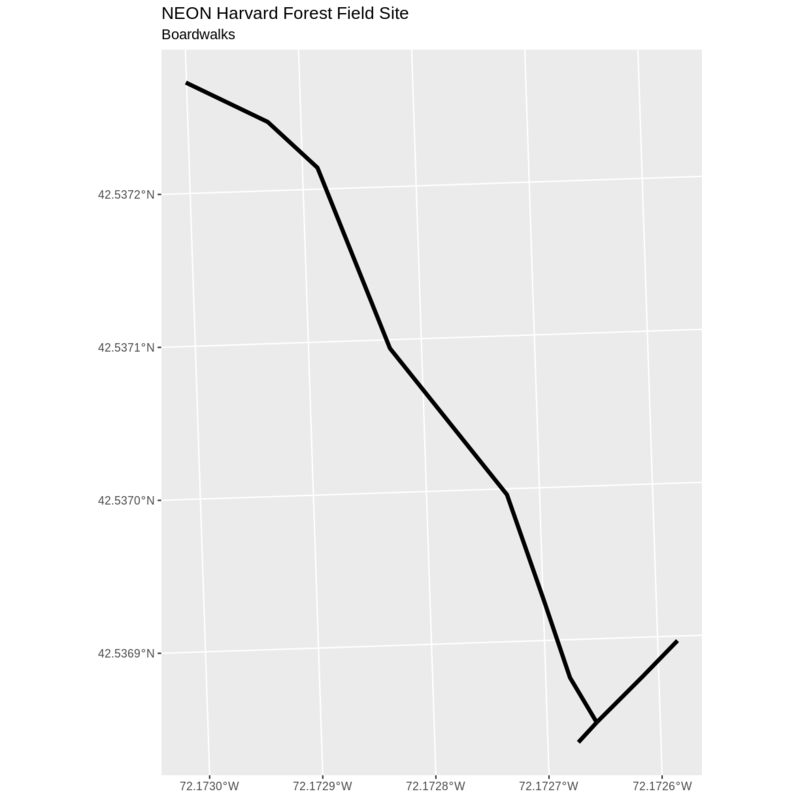 ggplot prints a warning when you do this, because it is not considered a good practice to plot non-spatial data this way. In the example above, we set the line widths to be 1, 2, 3, and 4. 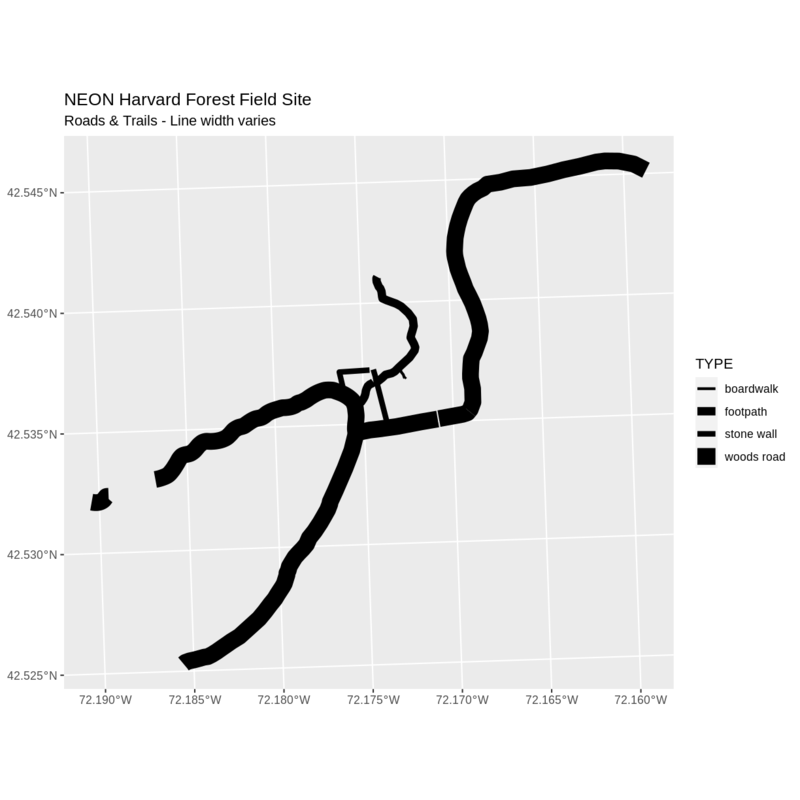 Because R orders factor levels alphabetically by default, this gave us a plot where woods roads (the last factor level) were the thickest and boardwalks were the thinnest. We then can create our line_width vector setting each of the levels to the desired thickness. Now we can create our plot. bottomright: We specify the location of our legend by using a default keyword. We could also use top, topright, etc. 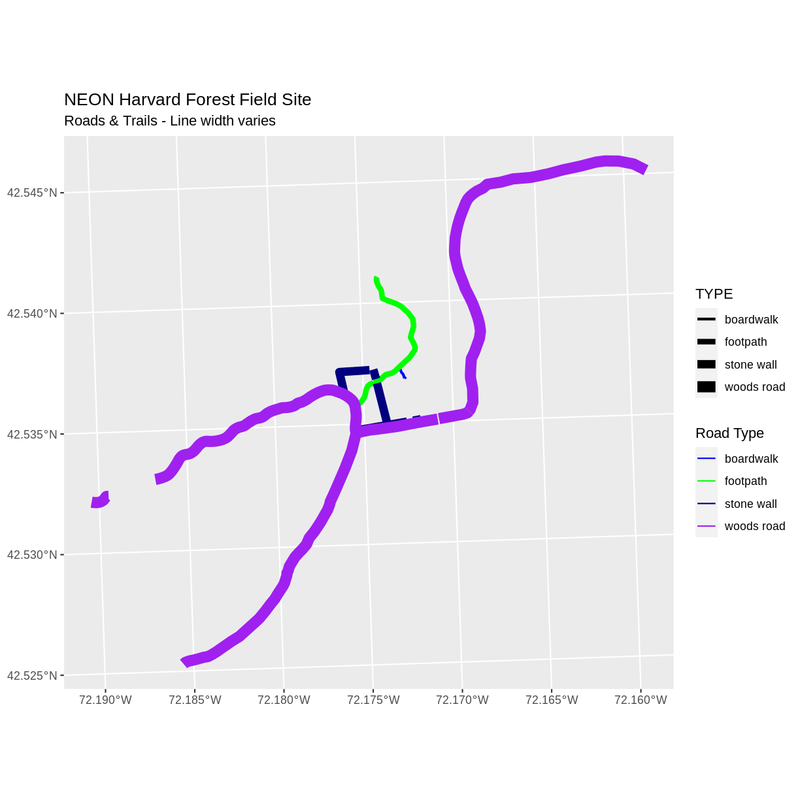 levels(objectName$attributeName): Label the legend elements using the categories of levels in an attribute (e.g., levels(lines_HARV$TYPE) means use the levels boardwalk, footpath, etc). fill =: apply unique colors to the boxes in our legend. palette() is the default set of colors that R applies to all plots. Let’s add a legend to our plot. We will use the road_colors object that we created above to color the legend. We can customize the appearance of our legend by manually setting different parameters. We can change the appearance of our legend by manually setting different parameters. You can modify the default R color palette using the palette method. For example palette(rainbow(6)) or palette(terrain.colors(6)). You can reset the palette colors using palette("default")! 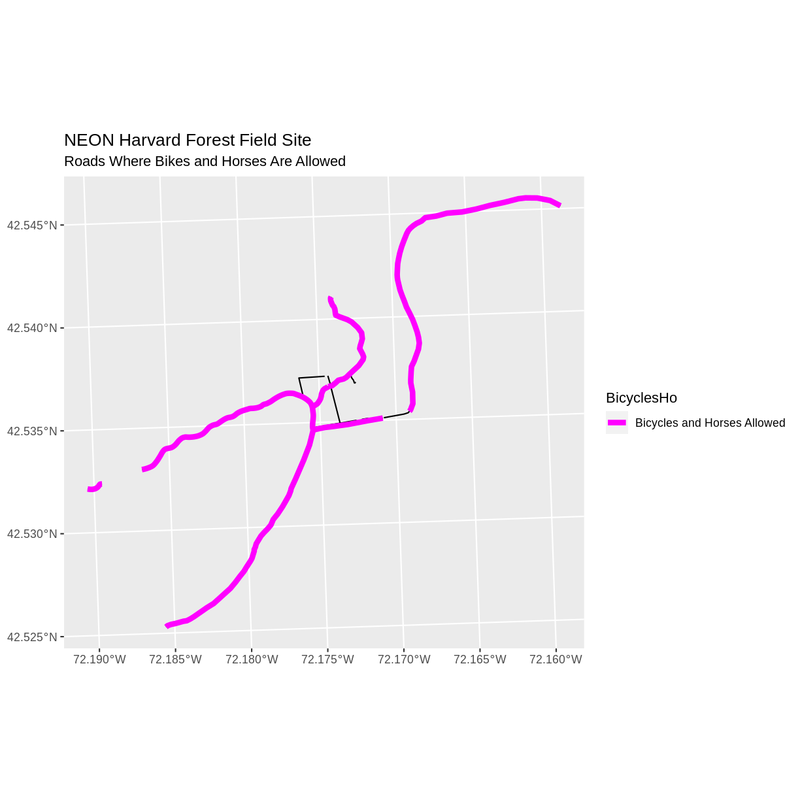 Create a plot that emphasizes only roads where bicycles and horses are allowed. To emphasize this, make the lines where bicycles are not allowed THINNER than the roads where bicycles are allowed. NOTE: this attribute information is located in the lines_HARV$BicyclesHo attribute. Be sure to add a title and legend to your map. You might consider a color palette that has all bike/horse-friendly roads displayed in a bright color. All other lines can be black. First we need to make sure that the BicyclesHo attribute is a factor and check how many levels it has. "Bicycles and Horses Allowed"     "Bicycles and Horses NOT ALLOWED"
 "DO NOT SHOW ON REC MAP"
Next, we will create a new object lines_removeNA that removes missing values. 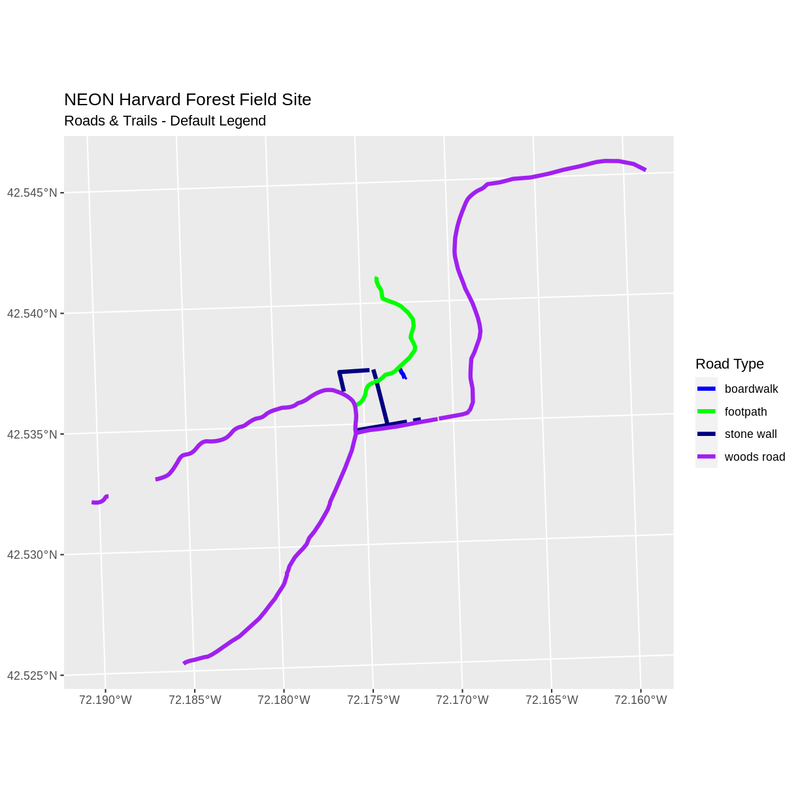 In our plot, we will set colors so that only the allowed roads are magenta, and we will set line width so that the first factor level is thicker than the others. 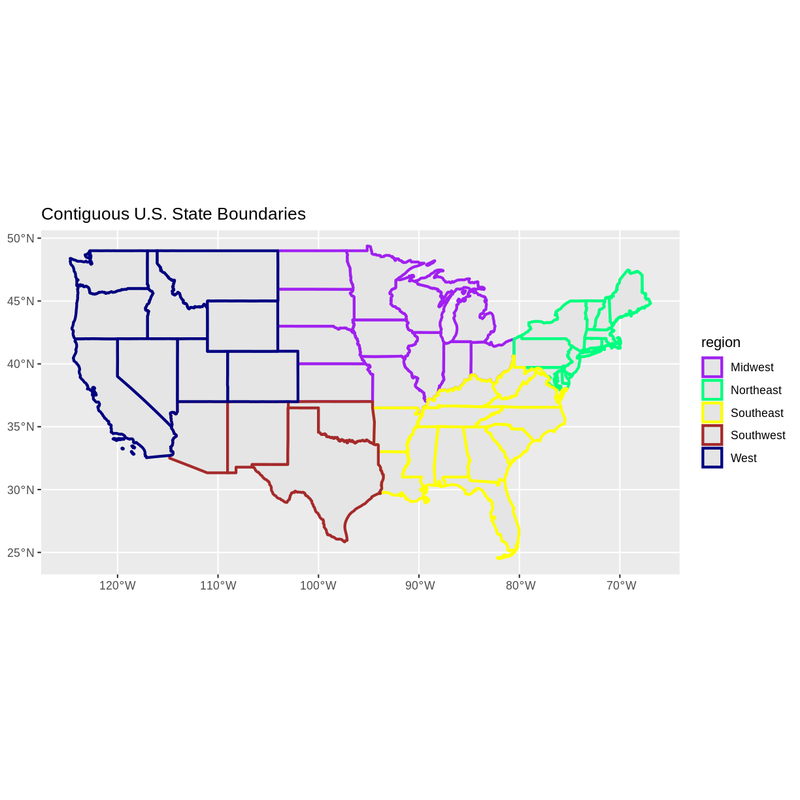 Create a map of the state boundaries in the United States using the data located in your downloaded data folder: NEON-DS-Site-Layout-Files/US-Boundary-Layers\US-State-Boundaries-Census-2014. Apply a fill color to each state using its region value. Add a legend. "Midwest"   "Northeast" "Southeast" "Southwest" "West"